With t shirt down, originally uploaded by indiaeden. 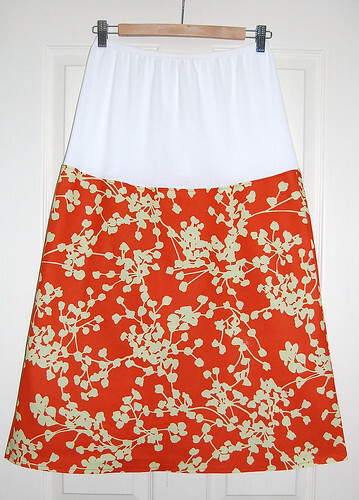 Just a simple summer skirt. The pattern needs a couple of minor adjustments,but I'm pretty happy with the results so far. The skirt is cut on the bias to give some flexibility to the top, and the over the bump band is generous, though can be folded down like yoga style pants if desired. 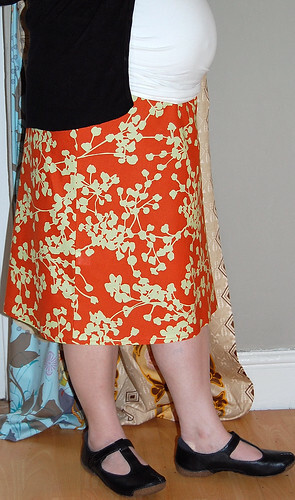 Very similar to the winter skirt I made,but now the sun is threatening to start shining (maybe? ),I thought it might be time to scare the world with my white (and rather stubbly!) legs! Once I've refined the pattern, I may post a tute if anyone is interested. Tute away please - it is a lovely skirt .... I know it is scarey to expose ones legs !! !